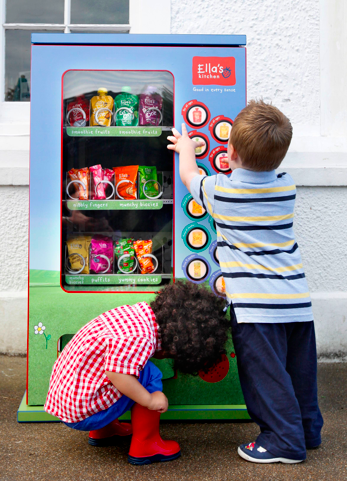 Ella’s Kitchen has taken a brave step and launched a vending machine specifically for kids. The machine is packed full of heathy Ella’s Kitchen snacks for when that snack attack moment hits and mums can be reassured that the products are free from nasties associated to many brands. The beauty of the Ella’s Kitchen brand is that it really does communicate to children at their level and through their eyes, by using things like bold bright colours, simple product names and easy to use pack formats. So, no surprises then that this vending machine is made for kids to use. The bright buttons allow for children to interact with the brand in a playful way, helping to educate children too. This is a real breakthrough and a great way for children to interact with the Ella’s Kitchen brand more directly.